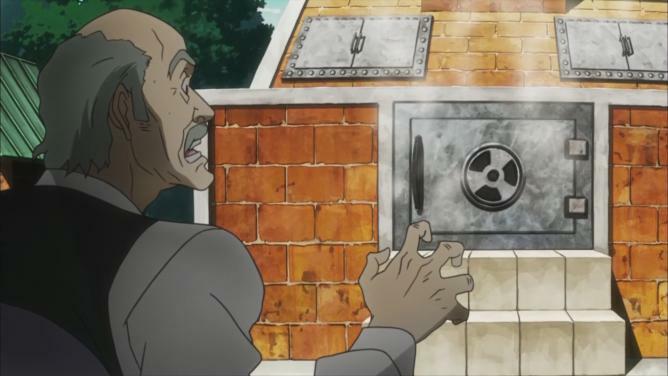 JoJo’s Bizarre Adventure, episode 1 is so bizarre! 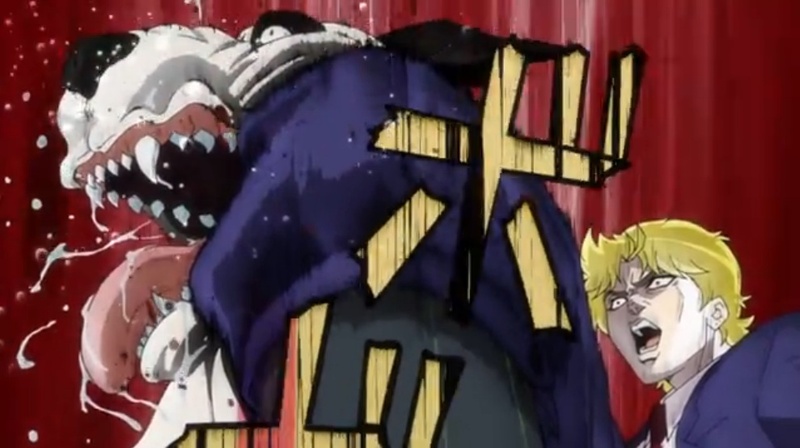 Just saw the first episode of JoJo’s Bizzarre Adventure, and I was surprised by how bizarre it was. I didn’t know JoJo was a comedy, because when I read the manga, I remember it was deadly serious. JoJo’s manga has been around from the 1980s, and it’s still going on. I read when I was a kid, only the first arc, but I forgot everything. So, it’s refreshing to see it in a form of anime. So, I’m pretty excited that the anime came out. And the anime is bizarrely hilarious! Basically, it starts with a fight between a rich kid and a poor kid. JoJo as a rick kid and Dio as a poor kid. So, Dio wants to make JoJo suffer as much as he can. 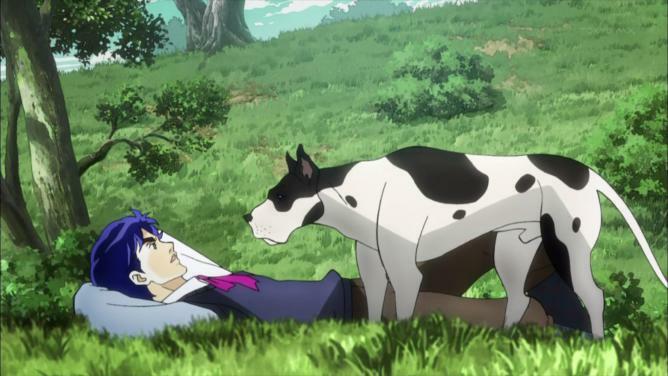 So, he starts off by abusing JoJo’s beloved dog, Danny. Yes, giving a knee kick to Danny’s face in front of JoJo, that drawing with an onomatopeia was too hilarious. Excessively over dramatic gekiga style! Yes, like gekiganger from Nadesico. But Dio fails to ruin JoJo’s life. JoJo soon meets Erina, a pretty blond girl at idyllic pasture, typical 19th century English gentry class romance, and he starts dating her. So, enraged Dio plans to break them up, taking away JoJo’s happiness and make him suffer a great deal. So, he went on to NTR, stole the first kiss from his girlfriend. 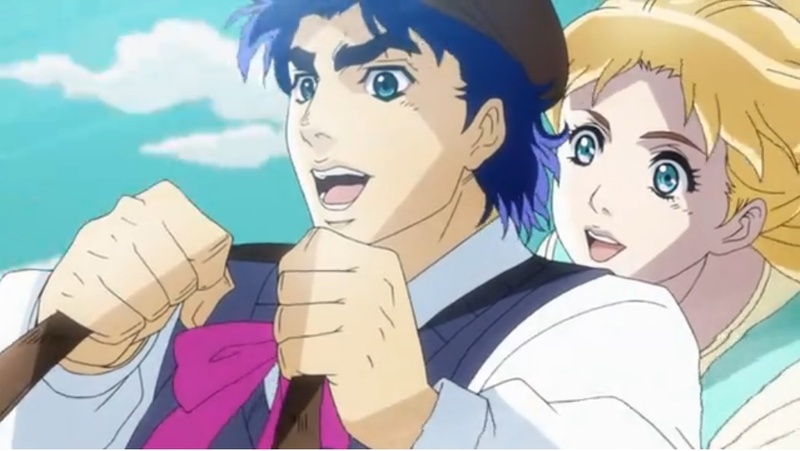 So, Erina suddenly stops seeing JoJo, and devastated JoJo goes to beat the crap out of Dio. 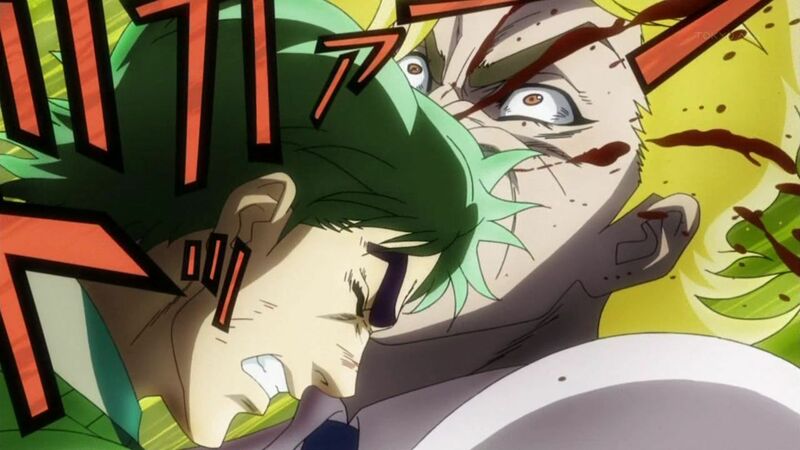 But later, in revenge, Dio kills Danny in the cruelest way as possible. Danny was put in a wooden box sealed and left in an incinerator, and then burned alive. Ultimate animal abuse that ahimsa animal right activists will explode! Clearly, the burning Danny scene was self-censored in the anime, for it was too gruesome to watch on TV. So, Jojo lost his girlfriend. And his beloved dog, Danny. All his beloved ones. Yes, I somehow get Dio’s “Riajuu must explode!” But he takes it to the extreme. Come on, he’s an ikemen, why doesn’t he find a girl for himself? He can score any girl he likes, but doesn’t. So the only explanation for his bizarre behavior is that he’s a psychopath, driven by ressentment that Nietzsche talked about. He’s like Sae from Peach Girl, her actions all driven by ressentment, and her paranoiac obsession with Momo, she herself is bizarre, but Dio’s obsession with JoJo is far more bizarre than anything else! Yet, the way they presented it is also so bizzarre, and to the point almost forgets its cruelty. And onomatopoeias used in the manga are also there in the anime, which is uncommon, bizarre indeed. And that bizarreness made it so hilarious. Yes, everything looked bizarre indeed! And surprisingly, the ED of Jojo is Yes’ Roundabout. Progressive rock! It so matches the show’s bizarreness. Perfect choice!